Jay fell in love with mountain biking over 25 years ago and never looked back. Growing up in rooty, rocky, New England, he honed his technical riding skills and developed his love of the mountains. After graduating from Plymouth State University with a degree in Physical Education and Coaching, he set his sights on the great Rocky Mountains of Colorado and began his professional career in the cycling industry. Jay has been a part of several influential cycling companies over the past two decades such as Wheels Manufacturing, Specialized Bicycle Components, and Quality Bicycle Products. With his background in education, he is able to provide clear, precise instruction to help riders of all abilities accomplish their personal goals. He is currently Missouri’s only BICP Certified Level 3 Skills Instructor. 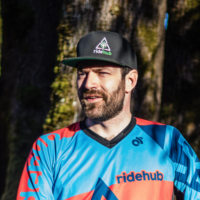 In 2014, Jay established his clinic business, Roots Mountain Biking, LLC specializing in beginner and intermediate skills clinics and women’s specific MTB weekends. He and his team of instructors conduct these skills clinics throughout the Midwest and beyond. When he is not teaching, he is working to support his Roots MTB Women’s team at their various events.